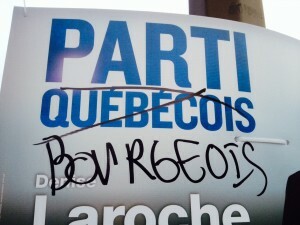 Anti PLQ election graffiti in Montréal Anti PQ election graffiti in Montréal. In case you’ve been living under a rock the last few weeks (or under a thesis), you should know that today, Monday April 7, 2014 is election day in Québec. Across the province, people are making their voices heard in what has been an interesting (to say the least) election campaign. This year, it was easier than ever for students to vote, as we could vote on campus over a period of four days. As a resident of a riding outside of Montreal, this made life easier for me, as I’m sure it did for many other students. I actually cast my ballot last week, without trouble. Then again, I have been resident here for more nearly 7 years; I pay taxes here, I have a Québec driver’s licence, a RAMQ card, and I own a house in Trois-Rivières. I’m already on the list of registered voters. I walked up to the polling station, presented my identification, and was handed a list of candidates for my riding, marked my ballot, placed it in a sealed envelope and went on my merry way. 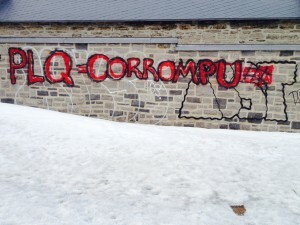 Published by marynalesoway on 2014/04/07 at 4:16 PM under General Discussions, Montreal. 0 comments.